Lawn and Garden Belts: What is Aramid cord? 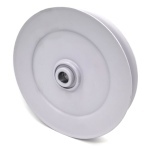 Idler Pulleys vs Drive Pulleys: What is the difference? 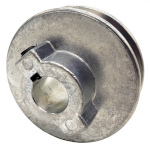 What is an Idler Pulley? Fast and Free Shipping with Phoenix! 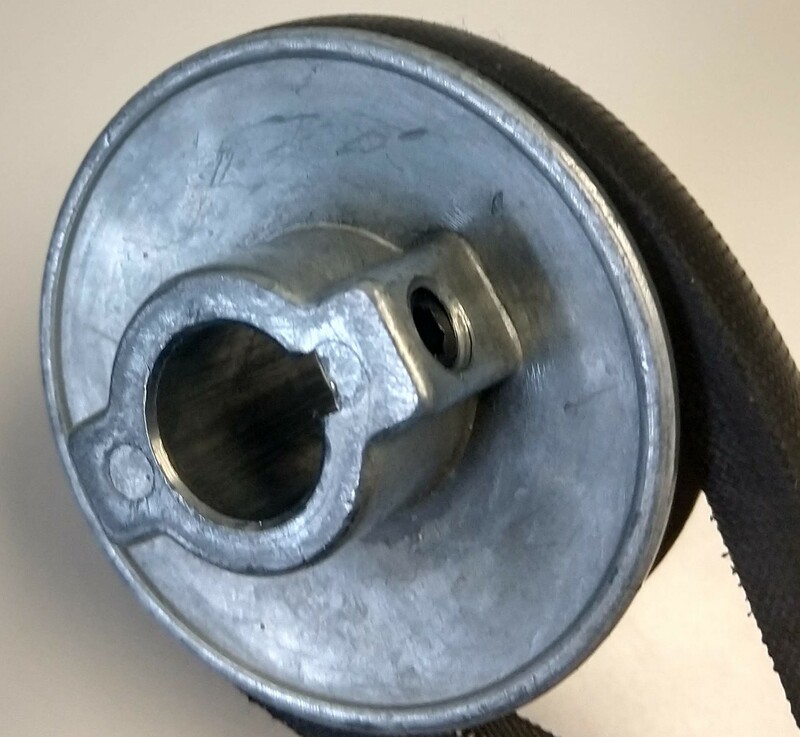 When you’re searching for a general purpose drive or idler, the most difficult and confusing part can be determining how a specific pulley will work with your belt. We don’t want you to get into a situation where you’ve to go add suspenders, now do we? Most of us are not designing machinery to precisely traverse interdimensional portals into alternate realities. Probably.So an engineering degree is not necessary to pick out most replacement pulleys. 1. What kind of belt are you using? 4L/A, 5L/B, 3L? Make sure to filter your search results to your belt. 3. How high or low do you want the belt to ride in the groove? It’s this last one that’s a bit tricky and the reason for this article. 4. Before you chuck out your old, busted v-groove pulley, learn where your belt rides in the groove. Was your belt sitting at the top, maybe with the belt hanging slightly over the flanges of the pulley? If so, take a look at the Belts that fit information on your pulley’s page. This section is sorted by belt size, so the largest belt is always listed last. Make sure that that your belt size is the last belt listed in the description. IF YOU DON’T: When you reassemble your machine, your belt is going to be looser than expected. And then your belt will slip, and you’ll feel like a real loser. Slippage is no joke. 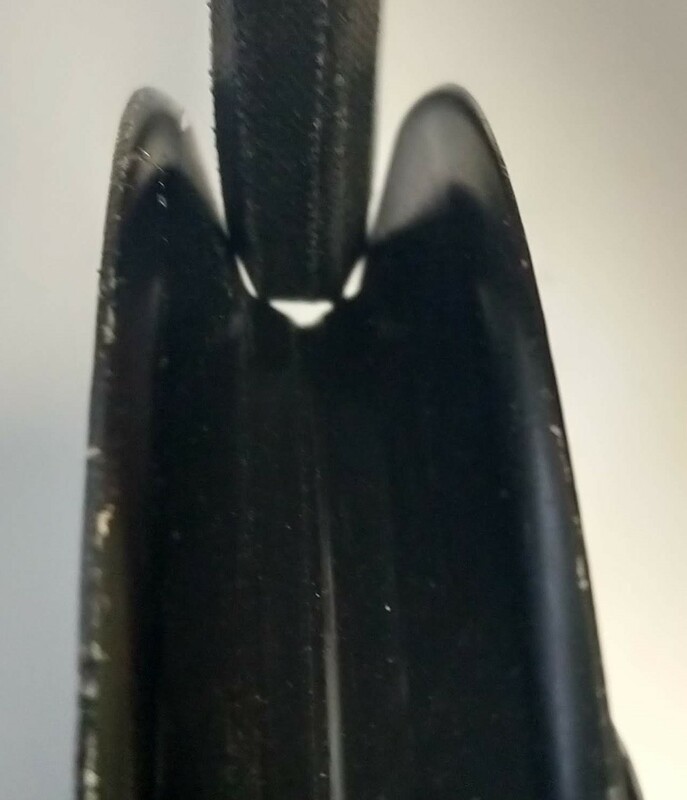 Was your belt sitting around the middle of the groove? This will guarantee your belt will not be riding at the top of your pulley because a bigger pin means a larger belt fit into the groove. Was your belt touching the center of the pulley? Then you were probably ripping through belts more often than you’d like. You were also losing a significant amount of power, so no wonder you want a replacement! The bottom or narrowest part of your belt should never touch the center of a v-groove pulley. 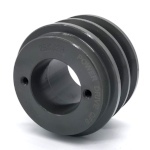 Try getting a pulley with a slightly smaller outside diameter instead of matching the one you have. So I did the math, and if a picture speaks a thousand words, what follows will save us all some time. 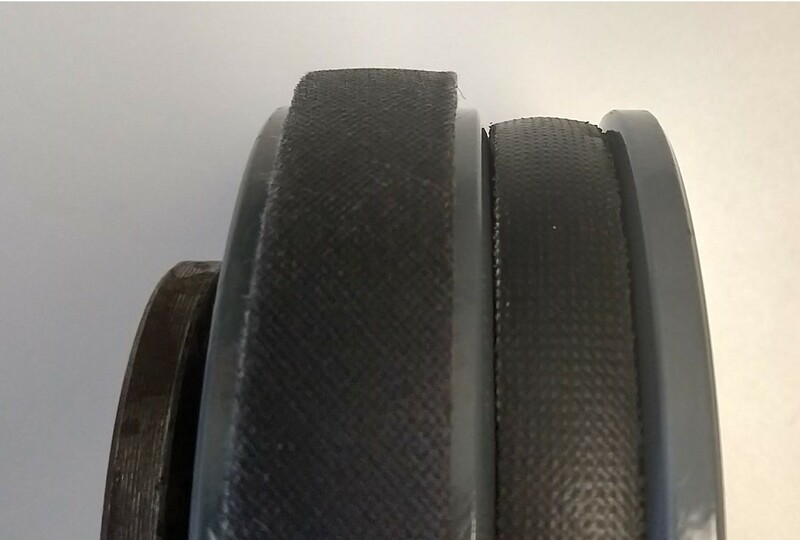 Notice how high the 5L belt (on the left) sits in the groove, this is largest acceptable amount If more than about 1/3 of your belt is showing above the top of the pulley, your belt will likely not have enough grip. Slippage is a real possibility you'll want to avoid. Here's an example of what NOT to do: See how the bottom of the belt is touching the center of the pulley? And there are gaps between the belt and the sides? 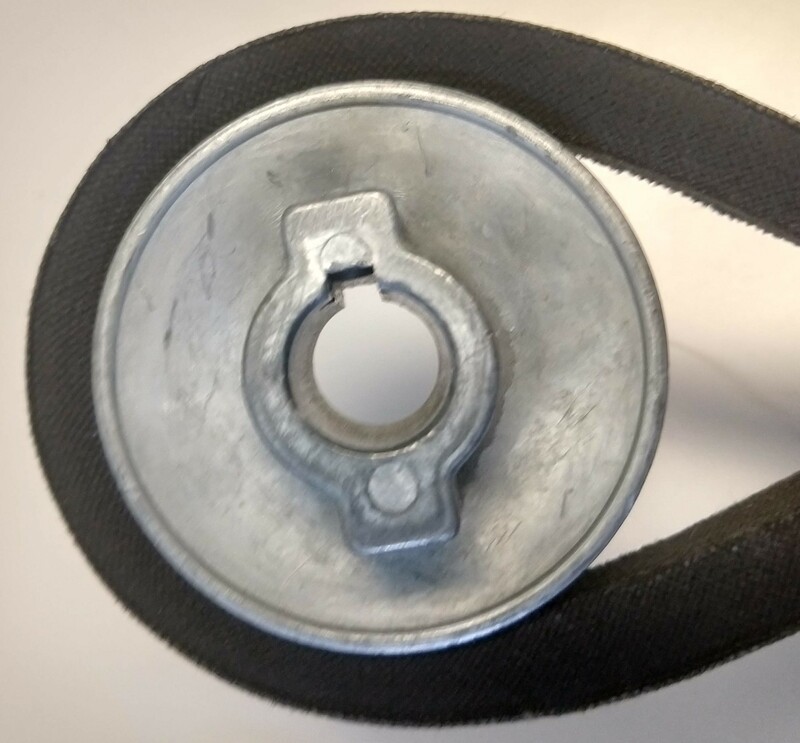 This belt will not work in the pulley, and no amount of tensioning will give good results. 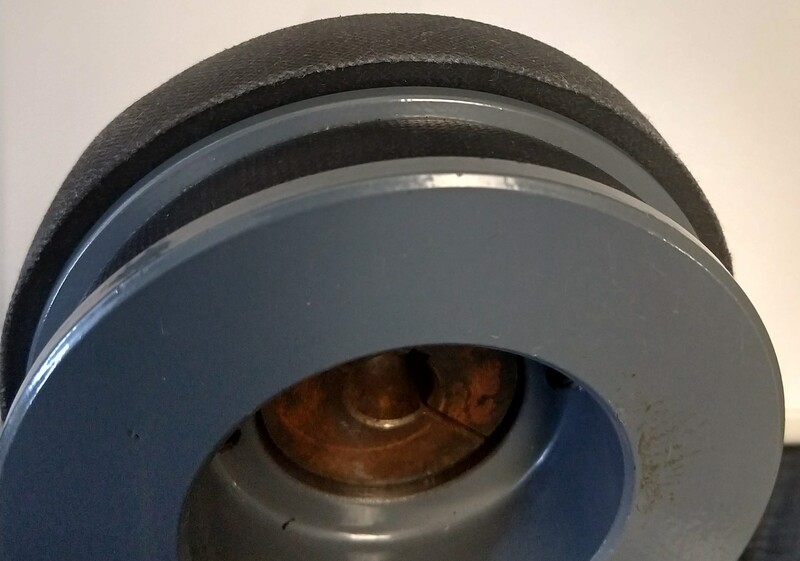 Here's an example of a 5L belt in the groove of a 4L pulley. See how much of the belt is visible at the sides? That belt is not contacted with enough of the pulley to allow for good power transmission. At the right is a 4L belt in a 4L pulley. Are you feeling a bit more groovy now? I sure am! Use code GROOVY for 10% off your next order! If you still have concerns, please give us a call at 1-800-776-9315, we love tie-dye around here. If you are, I recommend looking into timing pulleys as they are designed for precision.